Why? What’s keeping content marketers from leveraging SlideShare? After all, SlideShare doesn’t involve a major learning curve — it leverages your existing investment in PowerPoint, or its Mac equivalent, Keynote — both iconic presentation programs familiar to all content professionals. Cost can’t be the issue. 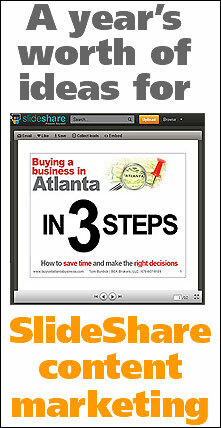 With SlideShare, you can start and do a lot for free. Even if you step up to SlideShare’s Silver and Gold “Pro” levels, monthly costs remain modest. In a way, content itself is the biggest obstacle keeping marketers from taking better advantage of SlideShare — that is, the obstacle of coming up with content ideas for SlideShare presentations. After all, once you decide on a concept and structure for a presentation, finishing the presentation usually moves forward quite nicely. The hard part is coming up with the initial idea. How-to-buy information addresses the biggest obstacle that can keep prospects from buying: fear of making a mistake. By showing prospects how to make an informed purchase decision, you’re building their confidence and increasing the likelihood of making the sale. Does Your Client Services Agreement Protect You From These 8 Potential Problems? This approach also offers an easy way to educate your market about the quality you offer and differentiate your firm from the competition. Buyers often default to price as a standard of comparison because they do not know what else to look for or how to evaluate quality and value. Creating SlideShare content around “Questions to ask” reflects your interest in helping customers make the right choices. The more you fine-tune your empathy and listening skills, the easier it will be to craft presentations from your market’s point of view. Take a good look at your prospects, clients, and customers. What separates the winners from the losers? What are the biggest mistakes you see being made over and over again? Don’t Make These 12 Mistakes When Leasing a Copier! “Mistakes” presentations are very easy to create. Once you identify the main theme and list the mistakes, you’ll find it easy to offer alternatives and suggestions that place your business — and your insight — in a favorable light. What are the latest developments in your field? What are the changes in the economy, government regulations, demographics, international trade, climate, or technology that your market is currently dealing with? And, more importantly, how are these trends creating threats, or opportunities, your clients and prospects must address? Topics like, 6 Possible Results of Rising Interest Rates or 8 Ways Changing Medicaid Reimbursement Legislation Can Reduce Discretionary Spending help you keep your market informed while you describe how you can help your market anticipate changes and — with your help — make the adjustments they need to remain successful. Another easy SlideShare presentation topic is to define and clarify the meaning of the words most frequently used in your industry. To get started, think about what the terms and buzzwords are that your customers and prospects must know? Or, put another way, use your SlideShare content to demystify commonly misused or misunderstood words in your field. One of the easiest ways to project an image of knowledge, credibility, and helpfulness is to identify and recommend the best books, tools, or most useful websites in your field. Offering annotated lists like these reflect your understanding of the industry landscape and the most relevant offerings in your field. It also gives you an opportunity to demonstrate that your business is qualified to make intelligent comments and recommendations. Because they do not know all possible options, many customers and clients may not have purchased a complete solution to their problems. Because the sellers did not fully describe all options, or because the buyer’s needs have changed, prospects may not be obtaining full value from their original purchases. Best practices can also take on a life of their own when you enhance your approach by interviewing leading figures in your field and using the ensuing transcriptions as source material for your SlideShare presentations. Metrics are measurements you share to help your market evaluate and improve their current efforts. Metrics replace habit and hope with quantifiable data. By showing what’s working, and what’s not working, metrics can highlight areas of improvement which might coincide with your firm’s products and services. They are evergreen topics: The subject matter will never go out of date. Familiarity: Each topic is based on information you already know, although the information will likely be highly desired by your prospects, clients, and customers. Relevance: Each presentation addresses issues of critical importance to your market. List-based: Each presentation topic includes a number, which makes it easy for you to identify the main ideas in your presentation and organize them into the right order. Format: Each presentation topic shares your expertise in an editorial, or “news,” format (instead of as “advertising”). Focus: Limit each slide to a single idea. Organize: Start your presentation by discussing the relevance of the information that follows, present your ideas, then conclude by reviewing the importance of the ideas and the next step you want your prospects or clients to take. Expand: Expand each idea into a linked blog post or article that provides more-detailed information. Serialize your presentations: Consider breaking each of the above presentation ideas into a multi-part presentation posted at weekly or bi-weekly intervals. Each installment can create “news” value and enhance your search engine presence. Enhance: After uploading your presentations, add audio narration and/or insert relevant YouTube videos. Recycle: Reformat your ideas as podcasts, videos, or speeches. Each year, prepare a “best of” compilation. To get started on the road to SlideShare content marketing success, build your ideas into your editorial calendar, assign one of the above ideas to each of the 12 upcoming months, and then delegate and schedule the activities required for each presentation. You’ll soon be on the road to consistent and increased SlideShare content marketing success. Editor’s note: You can now also view this blog post in Slideshare.